SMi are thrilled to welcome Dr. James Hamilton, Vice President, Head of Clinical Development, Arrowhead Pharmaceuticals onto the speaker panel RNA Therapeutics 2018! Dr. James Hamilton is currently responsible for all aspects of clinical trial design, implementation and execution. In this role, Dr. Hamilton managed the ARC-520 and ARC-AAT global programs through Phase 2 of development. Previously, Dr. Hamilton was Medical Director and Head of Corporate Development at Arrowhead. He led Arrowhead’s acquisition of the Novartis RNAi assets and led Arrowhead’s $670 Million cardiovascular deal with Amgen. Dr. Hamilton previously served as CEO of Calando Pharmaceuticals. He earned an MD and MBA at The Ohio State University and is board certified in Emergency Medicine. We had the chance to interview Dr. Hamilton about his background and career experience. Q. What do you believe are the biggest challenges associated with developing an RNA Therapeutic? A. Identification of novel targets that can be modulated with available delivery technologies. Q. What lessons can be learnt following several years of RNA-based therapeutic development? A. Scientific endeavors such as the development of a new therapeutic class will inevitably be met with breakthroughs and setbacks. Learning from one’s mistakes and persistence are key. Hear more from Dr. James Hamilton at RNA Therapeutics this February 2018, as he presents ‘The Evolution of RNAi Delivery at Arrowhead’. RNA Interference is used to silence genes before it produces the protein, which is harmful for the body. However, in order for this to be effective, ways to safely and effectively deliver this therapeutic to its target must also be developed. Arrowhead Pharmaceuticals is one of the companies leading this search. 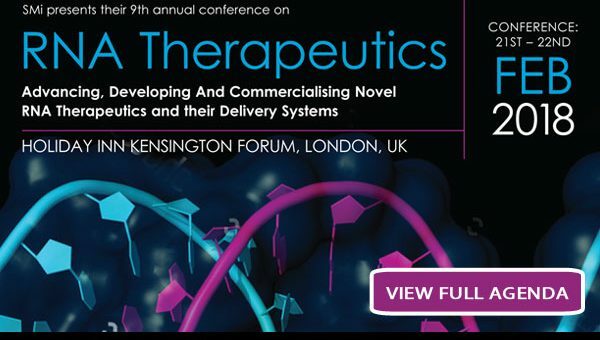 This presentation will cover the previous technologies Arrowhead have used, analyse the changes that have been made to improve the technologies and look at the potential of Arrowhead’s current synthetic siRNA delivery systems including dynamic PolyConjugates.